After submerging in the world of sci-fi and pathfinding robots for the Cinema event, it seemed to me that it was time to work on something peaceful and zen-like. While working on the shelving, I thought a nice feature for deciduous bonsai would be the ability to change seasons via a menu. That is how our newest product, the -Hanaya- Windswept Bonsai (Season Change) came about. Without hesistation, I chose the Shakan style of bonsai, as that is one of my favourite forms. More info on bonsai forms can be found here. The construction of the root structure, trunk and branches was a slow picky process – one of the things I love about creating in Second Life. Once the tree had its form, the work to create foliage, and to plant the bonsai in a pot appropriate to its shape and size was quick work. More fun followed in devising combinations for the 5 seasonal looks. The menu contains access control, so you can set it to either owner-only, to public access, or limit it to specific avatars. The bonsai is packaged with 5 matching original mesh display tables. 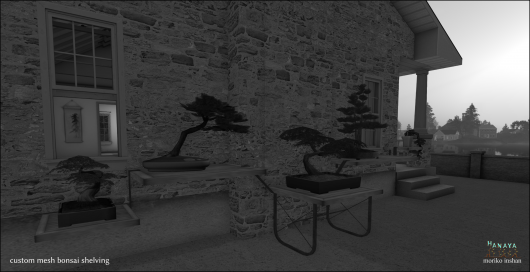 Combined with the bonsai, the Land Impact (including the optional table and ground shadows) is 12 LI. And since -Hanaya- celebrates it’s second anniversary in a few days, a single season Anniversary edition of the new bonsai will be the November group gift for VIP members of the -Hanaya- Yummy Collectibles in-world group. The gift will be sent out, as usual, on the group on the 1st of the month, and will remain available in the Customer Service area of -Hanaya- in-world for the month of November 2012. 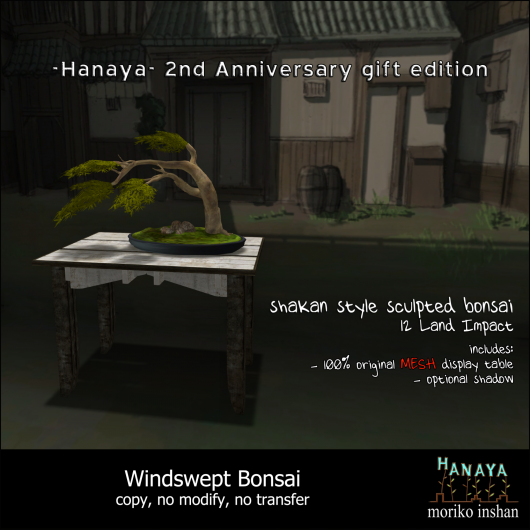 The -Hanaya- Windswept Bonsai (Season Change) is now available for purchase at our in-world store, where it is on display so you can play with it before you purchase. Too lazy to leave home to shop? Not to worry, our latest release is also available on the Second Life Marketplace. 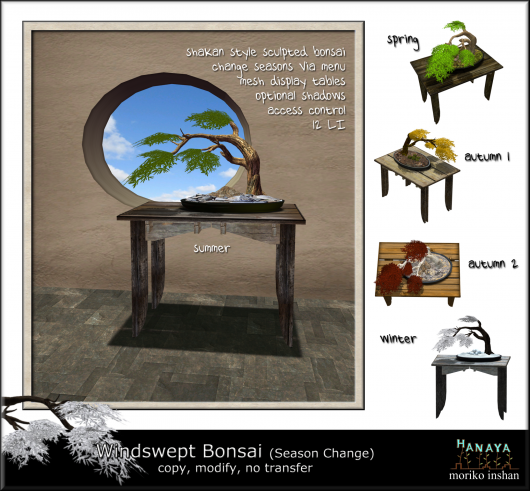 This entry was posted in Freebies and Gifts, Product Announcements and tagged -Hanaya-, bonsai, season change, shakan on October 30, 2012 by moriko. Not to be missed, the fabulous CINEMA event opened yesterday evening. Even if you do not spend a single linden on all the cool stuff available for sale, you must see the complex, all-mesh build commissioned by organizer extraordinaire RubyStarlight Writer (Exposeur + Hottie Cooterati). The amazing custom build was created by Isla Gealach-Nayar (Cheeky Pea) and Kaz Nayar (Pilot). 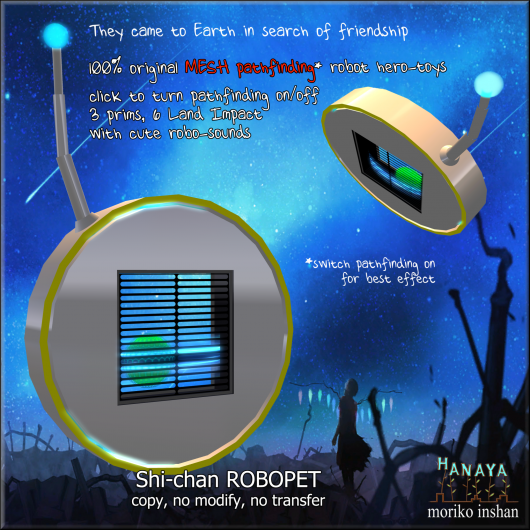 -Hanaya- has 5 brand new, exclusive products for the event – original mesh pathfinding robots. 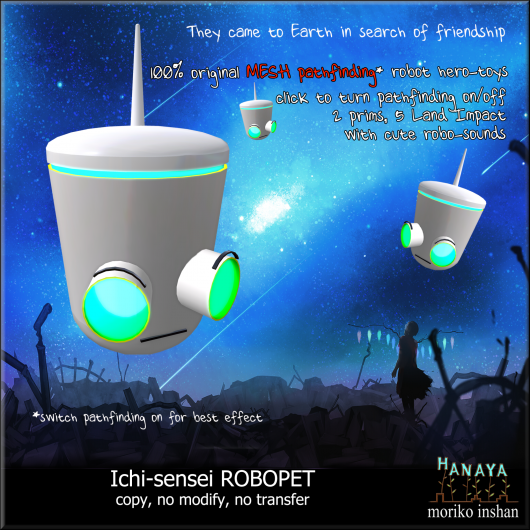 A collaborative effort between Moriko Inshan and Lance Corrimal, the 5 adorable robots made their first global appearance at the Cinema 2012 event in Second Life yesterday. Utilizing the Havok physics engine, the robots are programmed for pathfinding, which allows for real-time collision avoidance in three dimensions. “Designing the robots and then creating the meshes was a really fun project”, says Moriko Inshan, lead conceptualizer, designer and creator. Moriko is the creative force behind -Hanaya-, a 2 year old virtual business in Second Life. 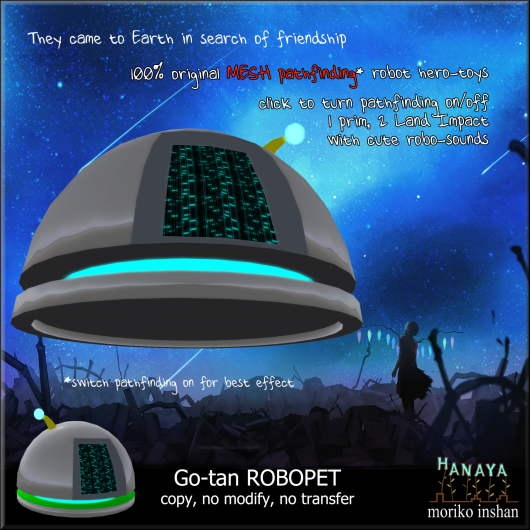 Visit -Hanaya- at Cinema in the Sci-Fi theatre section, and grab our customer gift. This entry was posted in Events, Freebies and Gifts, News and tagged cinema, customer gift, freebie on October 14, 2012 by moriko. Go-tan, the first of the Wilson Primes. Not nearly so destructive as a tornado or a hurricane, nevertheless, Go-tan packs plenty of firepower of the brain-kind. Their mission? Find populated worlds in trouble and help by making friends and sharing knowledge. And Earth needed help, fast. Our cute little robopets are programmed to speak to you in robosounds – 9 of them. And when you click them to activate their pathfinding function, they will zip around following your land terrain or ‘walkable’ prim surface. The fabulous Cinema event starts TODAY!. If you want to see their pathfinding action, please stop by Earth -Hanaya- in-world store where pathfinding is enabled. This entry was posted in Events, Product Announcements and tagged cinema, pathfinding, robopet on October 13, 2012 by moriko. Sansan-san. Seven of Nine? No, more like third of three. Or Mr. π². The rumors of his death were greatly exaggerated, Shi-chan is alive + doing well. Pathfinding robots, coming to a Cinema near you on October 13, 2012. Want to see them in action? Stop by Earth -Hanaya- in-world store to see them do their thing. The fabulous Cinema event starts on October 13, 2012. This entry was posted in Events, Product Announcements and tagged cinema, pathfinding, robopet on October 12, 2012 by moriko. Ni-kun. Second in command. Key skill – searcher. -Hanaya- pathfinding robots, coming to a Cinema near you on October 13, 2012. This entry was posted in Events, Product Announcements and tagged cinema, pathfinding, robopet on October 11, 2012 by moriko. Ichi-Sensei. He was the first among them. The wise one. 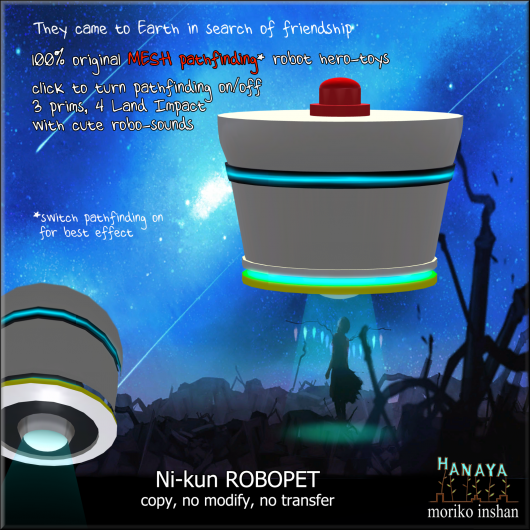 This entry was posted in Events, Product Announcements and tagged -Hanaya-, cinema, pathfinding, robopet, robots on October 10, 2012 by moriko. 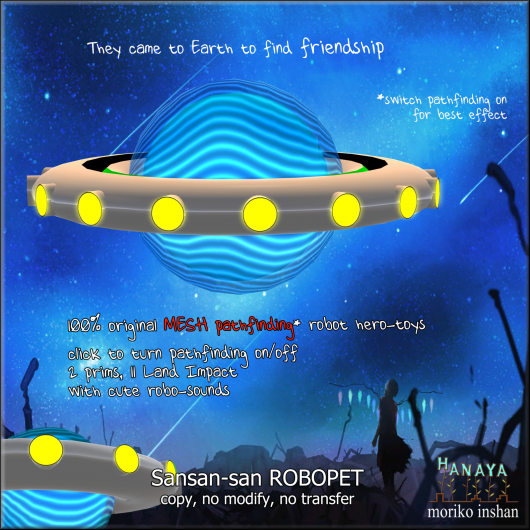 debut of “ROBOPET, the path to friendship” on October 13, 2012. Follow our robot hero-toys, as they land on Earth and seek to make friends in this breathtaking adventure that is bound to entertain audiences of all ages. 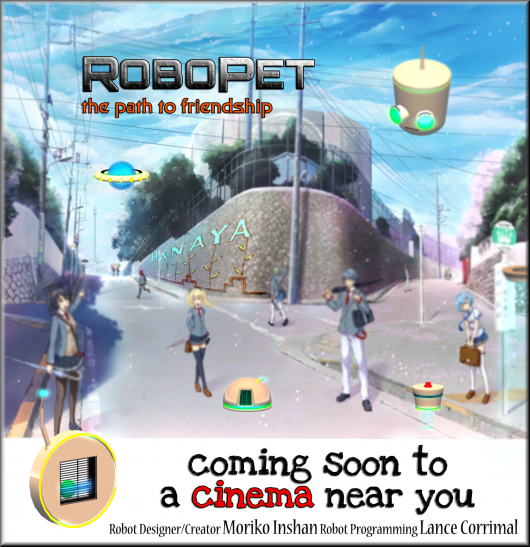 A collaborative effort between Moriko Inshan and Lance Corrimal, the 5 adorable stars of ROBOPET will make their first global appearance at the Cinema 2012 event in Second Life. Stay tuned for futher press releases, so you can learn more about the little meshy pathfinding friends. This entry was posted in Events, News and tagged cinema, havoc engine, pathfinding, robopet, robots on October 5, 2012 by moriko. or ‘walkable’ prim surface, navigating around in a realistic manner. The ghosts are packaged in a one-prim rezzer, disguised as a patch of fallen leaves. When clicked to activate, the slightly glowy ghosts will be rezzed in random locations within a 5 meter radius, and then freely navigate in a 314 meter² area following your terrain or ‘walkable’ prim surface. The ghosts are temp (usually last about a minute), have psychedelic colour-cycle eyes, and a new one is rezzed out every 45 seconds. Pathfinding is on by default on all mainland sims. In private estates, it can be switched on/off in the Estate Tools, for which EM is needed. So stop by our in-world store to see the -Hanaya- Spooky Pathfinding Ghosts in action during the month of October. Watch out though! Some of them may follow you into the store. 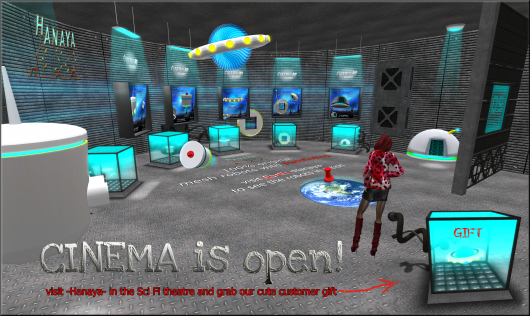 Available for purchase at the store as well as on the Second Life Marketplace effective today. A trick-or-treat gift for members of the -Hanaya- Yummy Collectibles in-world group is a single stationary Spooky Ghost. Once rezzed out, the ghost will randomly appear and disappear in the same location, emitting gently spooky sounds. A wearable, non-rigged mesh with a full-body alpha is also included. The gift was sent out on the group today, and will remain available to group members to the end of October at -Hanaya- in-world store. 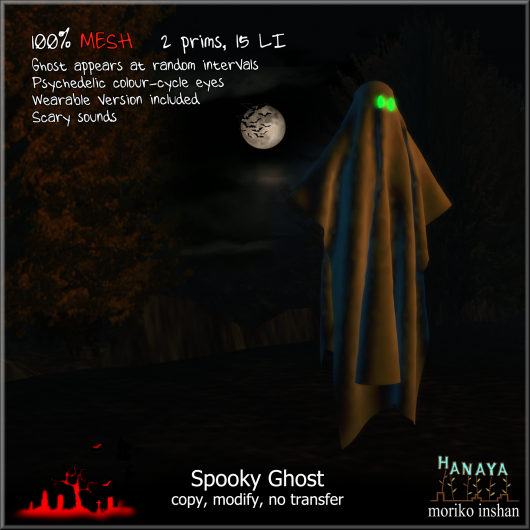 This entry was posted in Freebies and Gifts, Product Announcements and tagged free, ghosts, group gift, halloween, pathfinding on October 3, 2012 by moriko.